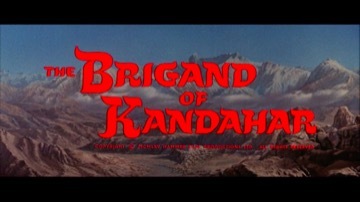 Opening title:- “Fort Kandahar. A British outpost on the North West Frontier of India 1850”. Lieutenant Case, hated by his army colleagues for being a half-caste, is convicted on a trumped-up charge of cowardice in the face of the enemy. He is dishonourably discharged and sentenced to ten years imprisonment, but manages to escape and, vowing revenge, he makes for the hills to join the rebel forces of Eli Khan…..
John Gilling’s directorial work for Hammer is listed in the footnotes for “The Pirates of Blood River”. Elsewhere, he directed numerous other films, including “The Gamma People” (1955), “The Flesh and the Fiends” (1959, with Peter Cushing), “Shadow of the Cat” (1961) and “The Night Caller” (1965).cCharacter actor Duncan Lamont made several appearances for Hammer in the 1960s, also turning up in “The Scarlet Blade” (1963), “The Devil-Ship Pirates” (1963), “The Evil of Frankenstein” (1964), “The Witches” (1966), “Frankenstein Created Woman” (1966) and “Quatermass and the Pit” (1967).